At the University of Detroit Mercy you never know if the instructor in front of you or the scrawny kid sitting next to you could be a future famous writer. That was the case at the University of Detroit. Elmore Leonard earned a degree from the University of Detroit in 1950 and has written many novels, some have been made into movies that include: Get Shorty, Mr. Majestyk and 3:10 to Yuma . His most recent work includes working as the executive producer for the television show “Justified”, which is based on his novel “Fire in the Hole. He must of been buried in his studies while at the university because I can’t find much while he was here except for a few pictures in the University of Detroit Tower Yearbook. 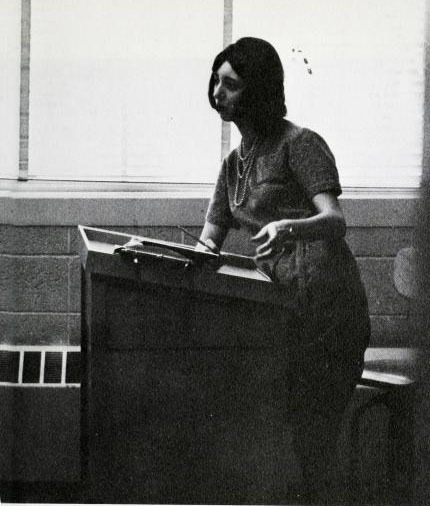 Joyce Carol Oates taught at the University of Detroit from about 1963 to 1966. 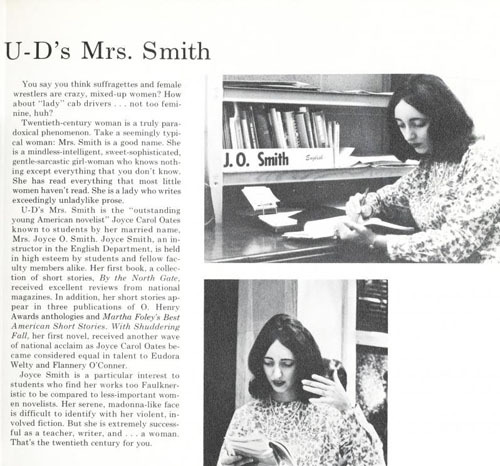 Students at the time would have known her under her married name Joyce O. Smith. 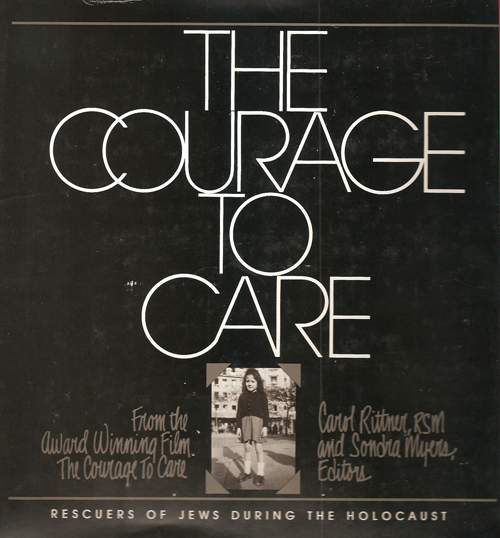 While at the university, she had a number of articles published in such publications as Atlantic Monthly, Shakespeare Quarterly and Transatlantic Review. Her short story book “By the North Gate” (1963) and novel “With Shuddering Fall” (1965) received favorable reviews, but her attempt at an off-Broadway play “The Sweet Enemy” 1965 was bombed by the critics. So the next time you go to class, look around-you could be sitting next to the next Nobel prize winner or future President of the United States! 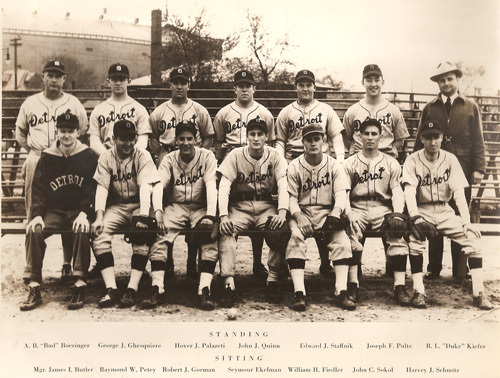 Even though the lack of manpower and resources prevented a varsity football schedule during World War II, they were still able to hold baseball games. Perhaps as a sign of the times the Varsity News, May 10, 1944 reported on a game with the Military Police. The game was won by the Military Police 2 to 1, but it was called at the end of 4 1/2 innings because of rain. Through the years the baseball program produced a few players that went on to play in the major leagues. 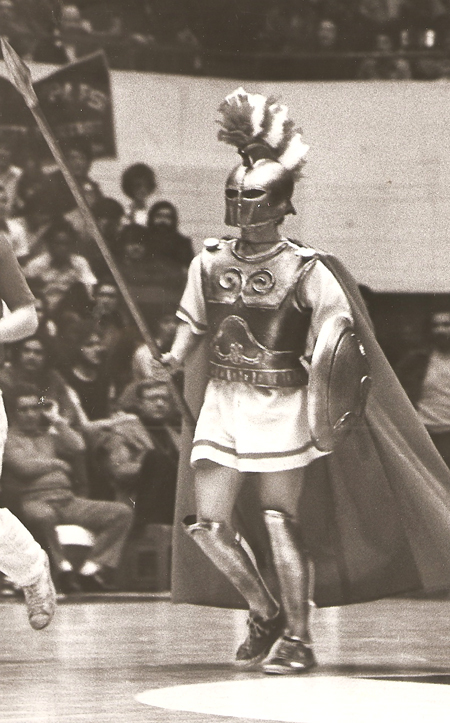 Dave Debusschere played both basketball and baseball at the university. He was one of the few players who also played both basketball (Detroit Pistons and New York Knicks) and baseball (Chicago White Sox) professionally. Bob Miller played for the University of Detroit for two years and pitched in the 1950 World Series for the Philadelphia Phillies. 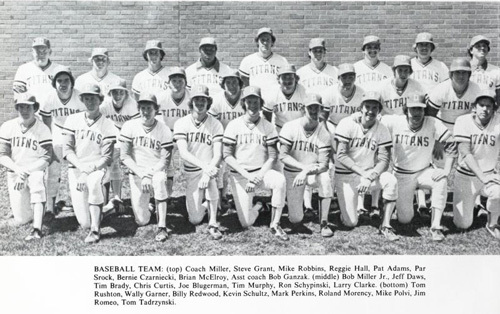 After ten years in the major leagues, he returned to the university as coach of the Titan team from 1965-2000. 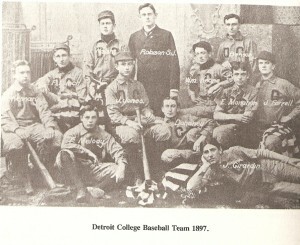 The university ended the baseball program in 2004 as a result of budget cuts. 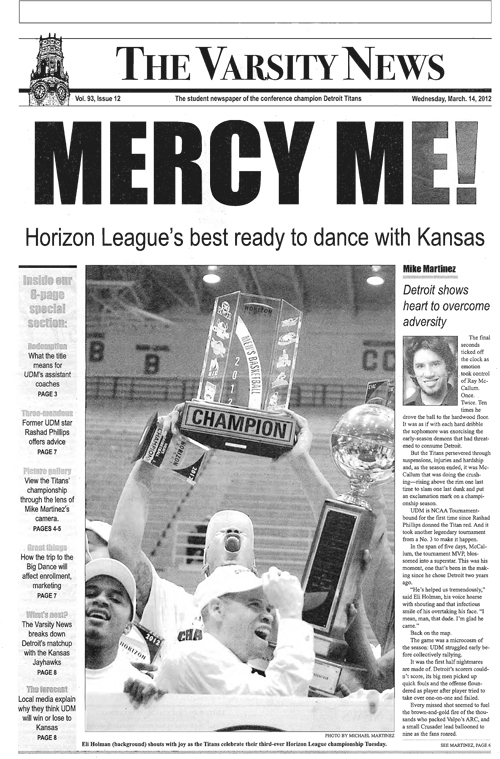 Like the football program, there is always the hope that the baseball program will be revived and once again be a part of the University of Detroit Mercy Athletic Department. 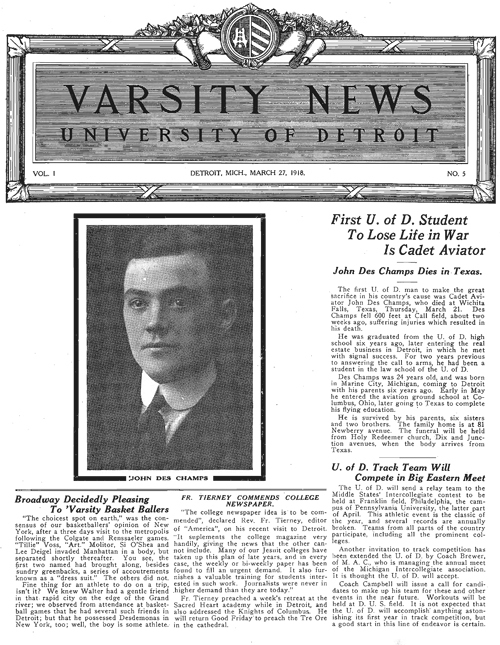 Perhaps one of the things that I have been most looking forward to is seeing past issues of the University of Detroit student newspaper “Varsity News” on line. You can now see from the comfort of you own home, every available issue from the very beginning, Vol.1, No. 1, dated January 30, 1918 to April 4, 2012. Check out what made the news on campus from the world events of World War I to the results of a university sporting event. In addition to the news, there are also plenty of old advertisements to ponder over. Just pick a year-check out what was happening the year you were born! There is plenty there for alumni to reminisce about. Remember when…. 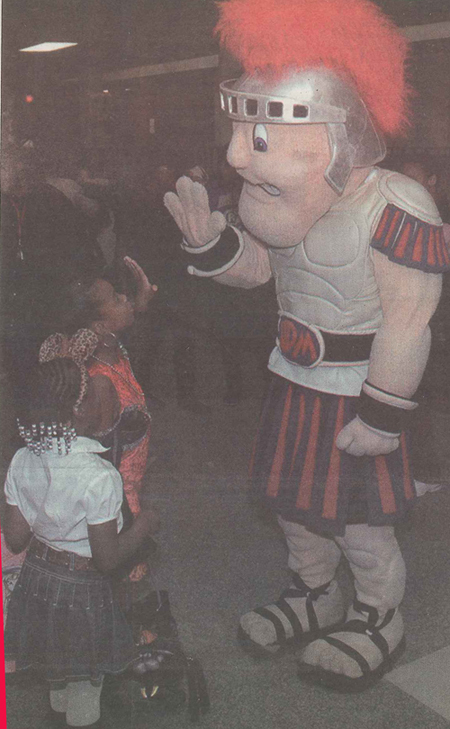 Between the Varsity News and the Tower Yearbook, there should be plenty for alumni and children of past U of D students to browse and remember. 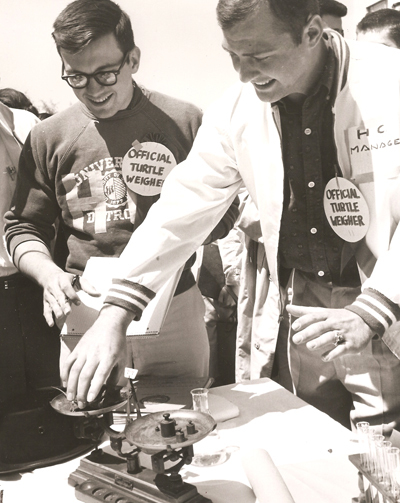 There are races like the Kentucky Derby, Indianapolis 500 and Tour de France-but the University of Detroit had the excitement of the Turtle Derby! 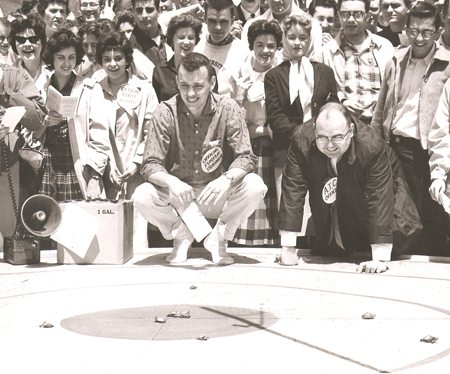 Turtle racing began at the University of Detroit tracks in 1935 under the auspices of Delta Pi Kappa, journalism fraternity as a local event, but within a few years grew nationwide, drawing more than 200 entries. A shortage of materials suspended the annual classic during World War II, but it was revived by the fraternity in 1946. 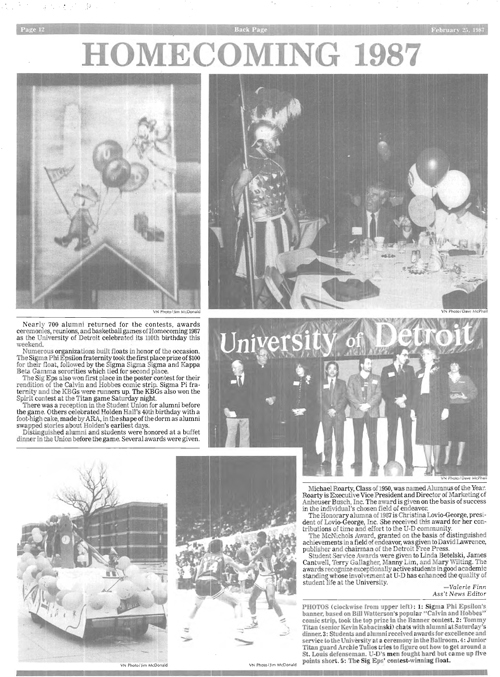 After the war it was held in conjunction with the University of Detroit Spring Carnival. 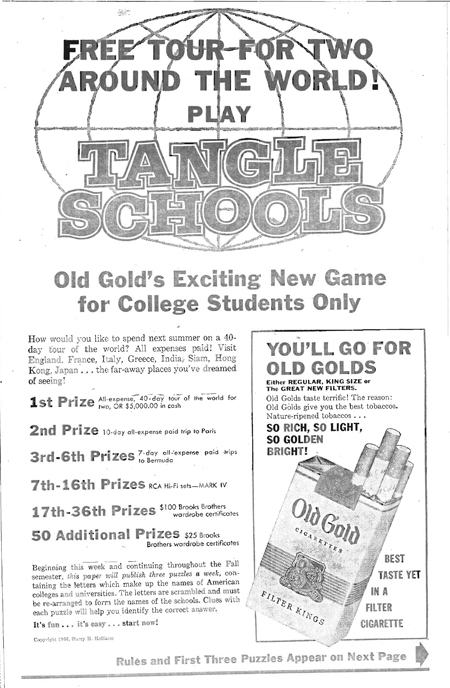 It also expanded to include not only other colleges in the United States, but other countries as well. Some of the countries that sent turtles included: Australia, Scotland, Taiwan, Germany, Canada, England and Sweden. One year the University of Moscow politely refused to enter a turtle and challenged U of D students to a chess match instead. There were some interesting sidelights to some of the turtles that were entered in the race. 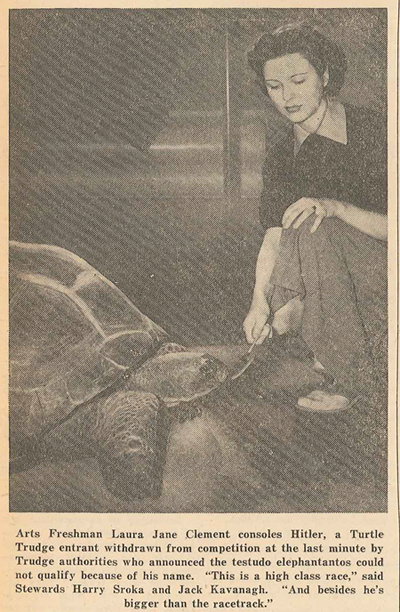 In 1939 the University of Tennessee entered a snapping turtle named Waddles. 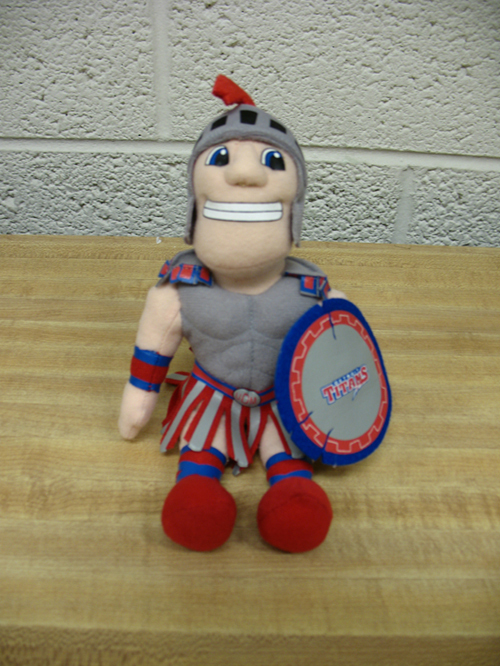 He was left in a case at the University of Detroit’s biology laboratory over the weekend. A biology student left 10 frogs in the case so Waddles would have some company. When the students returned they only found Waddles in the case. Waddles apparently enjoyed the frogs for Sunday dinner and lay in the corner, too stuffed to move-and the race was only five days away. 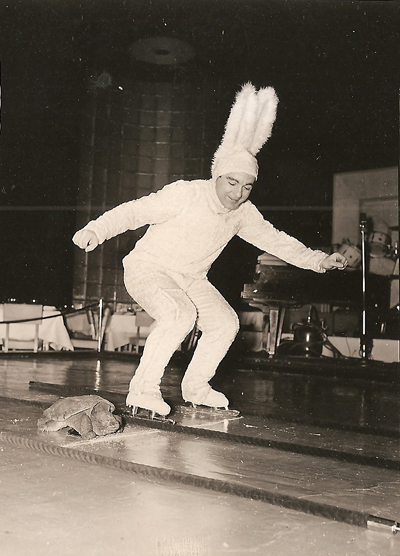 Another entry for the 1939 turtle race was scratched from the races unless the owner changed his name, “Hitler”. Check out his picture-that was one big turtle! An almost insignificant item to the 1939 “Turtle Trudge”, as it was called back then, is a note that “Radio Comedian Bob Hope was to award a trophy to the winner.” This would have been a time just before Bob Hope’s fame really took off with his “Road ” movies. The biggest problem was getting rid of the turtles after the race. Most of the owners specify that they don’t want them back. 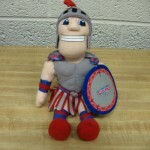 Students raffled them off to new homes and added the funds to the Spring Carnival Student Union Building fund. There is one turtle that might be missing on a trip back to its owner. There is a letter in the file from Los Angeles State College in 1961 looking for their turtle. It was apparently the pet turtle of a ten-year-old boy and he wanted it back. Nothing in the file to indicate if it ever made it back. I sure hope so-that would be an awful long trip even for a racing turtle to walk from Detroit to Los Angeles! 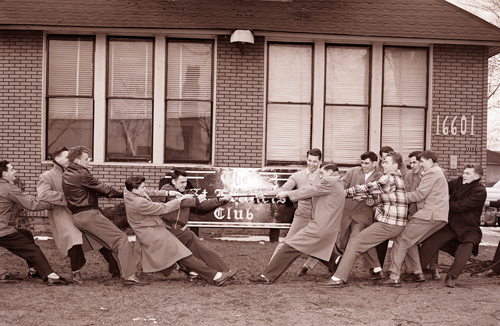 Legend has it that the whole thing began with a tussle between one Adolph Schultz and one Patrick Mahoney in 1949. During the noon-day repast at the St. Francis Club they both reached for a napkin at the same time. It was St. Patrick’s Day and the feeling had been running pretty high anyway about the German invasion of the U. of D. eating club. Once a predominantly Irish organization, the sons of Erin noted a creeping Deutsche influence and a recurrence of sauerkraut too frequently on the menu. The napkin tussle between Schultz and Mahoney developed into a regular Donnybrook, and was quickly moved out of doors as friends of the two napkin grabbers joined along nationalistic lines. It further developed into a tug-of-war when a stout rope was substituted for the napkin. Thus each year, sounds of ‘McNamara’s Band’ and ‘Ach du Liber Augustine’ have echoed through the hall of U. of D. on St. Patrick’s Day. The two factions don their green and orange T-shirts and begin to pull each other through the mud. According to the files I have, the Irish won in 1949 and the following years were pretty evenly split between the Irish and German teams. The archive files go through 1961 with the Germans taking the lead, seven wins to the Irish six wins. The tradition carried on for several more years, but that is as far as the files in the archives go. 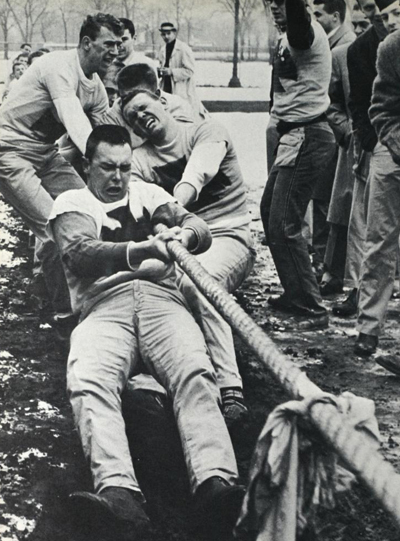 A little more research through the Varsity News indicates the St. Francis Club tug-of-war appears to have ended about 1983. 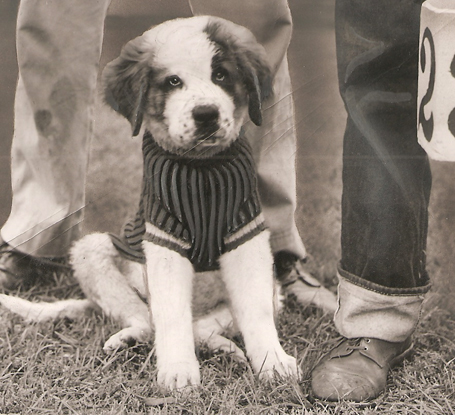 The next mention I can find of a tug-of-war between Irish and Germans is in 1986 between the Irish Engineers and German Architects and was sponsored by a commercial company which supplied food and T-shirts for the teams. 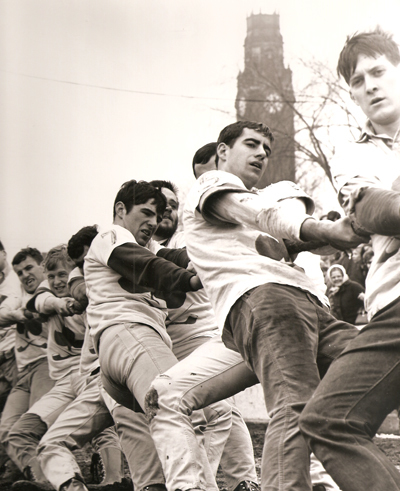 Nowadays when a tug-of-war event is posted, it is with some of the fraternities on campus. For several years when U of D put on a Spring Carnival they would announce an “American of the Year”. Arthur Godfrey, a radio and television entertainer, was the first person who was given such an honor in 1952 for his continuous fight for racial tolerance. Some of the other personalities who were given the title included Danny Thomas, Ed Sullivan and Perry Como. 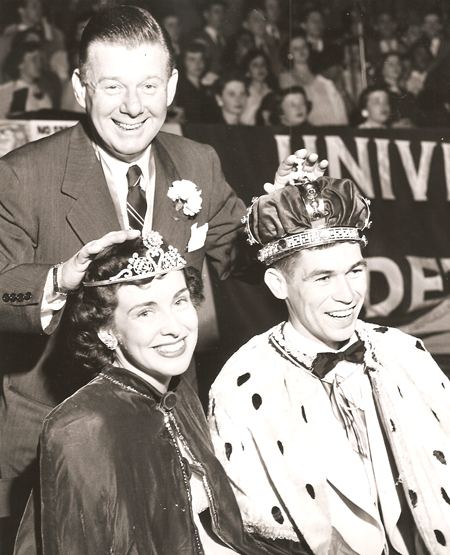 There are many stories to tell about the Spring Carnivals the University sponsored for many years, but the actions of Arthur Godfrey deserves some extra attention. 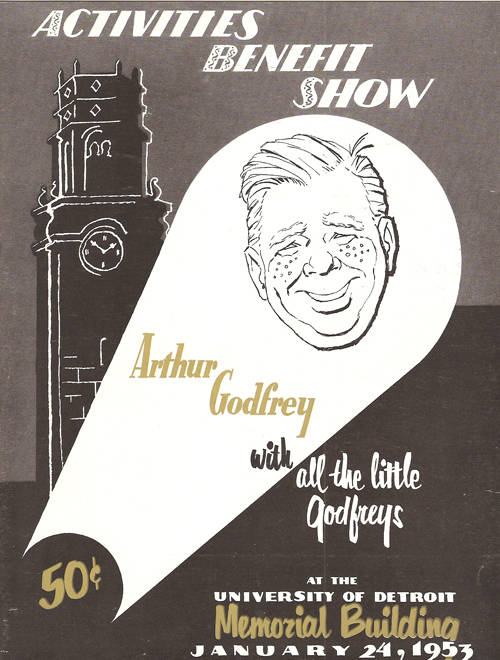 Some students went to New York to invite Arthur Godfrey to the Spring Carnival. They got to meet him after a morning show in which, after inviting them to lunch, he accepted the invitation. The students expected that after he had made a quick trip to Detroit for the carnival he would just return back to New York. Instead he arrived early and helped paint and set up booths. In fact he stayed the full two days of the carnival helping out and visiting booths that were not getting much attention. 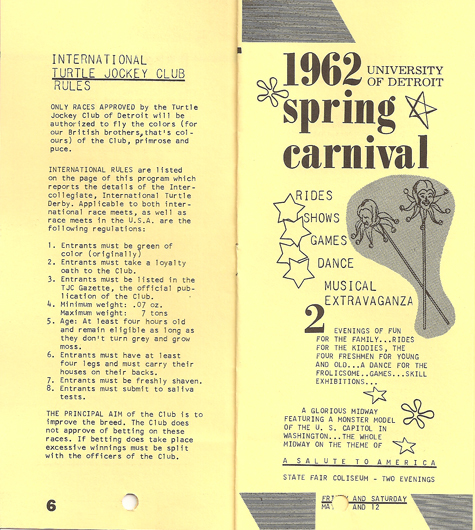 The Spring Carnival was a fund raising event for a Student Union Building. While Arthur Godfrey was here, he ate at the Union snack bar which was located in the basement of the Chemistry Building. He commented: “These kids don’t even have a real place to eat.” Before he left, he told Fr. 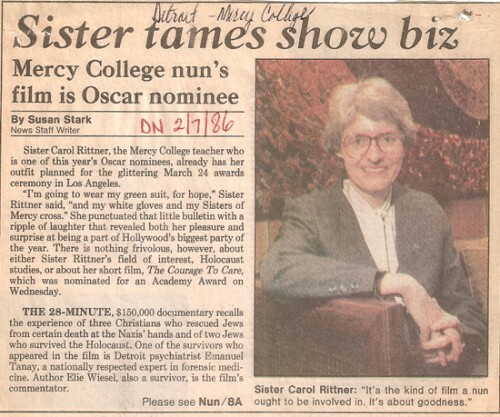 Celestin Steiner, UD President,: “I’ll be back with the whole crew and it won’t cost you a cent.” A few weeks later his business manager called and asked “When do you want him?”. 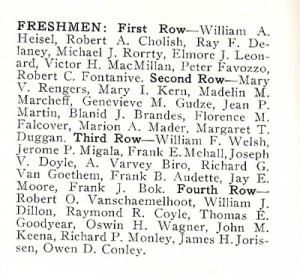 A date was set to use the Memorial Building (now Calihan Hall), and he brought his entire company. He paid for everything-transportation, tickets, orchestra and other talent. The show grossed $16,300 dollars. So the next time you have a Subway or Starbucks coffee from the Student Union Building, a little bit of it came as the result of the fund raising efforts of one red-head, freckled-faced entertainer of the 1950′s named Arthur Godfrey. 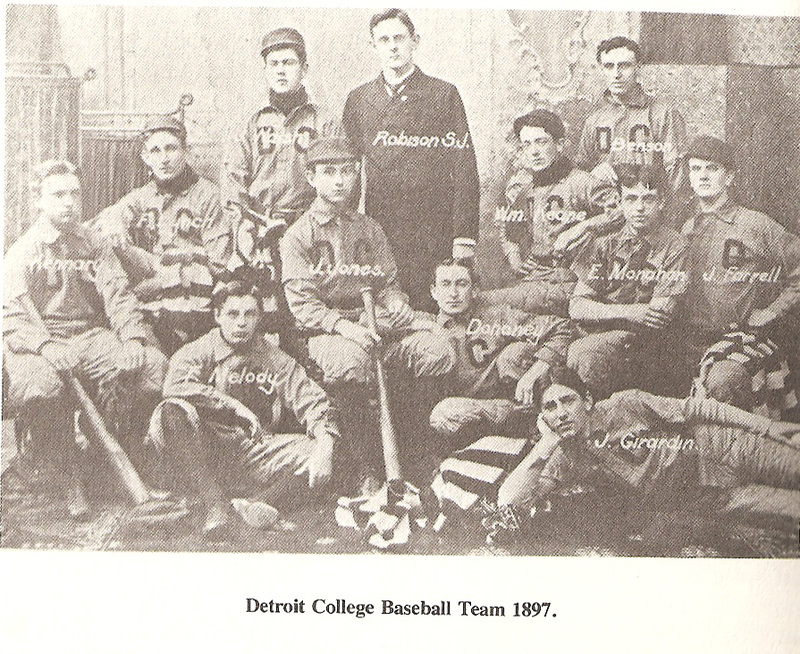 The first name for the sports teams at the University of Detroit was “Tigers”. 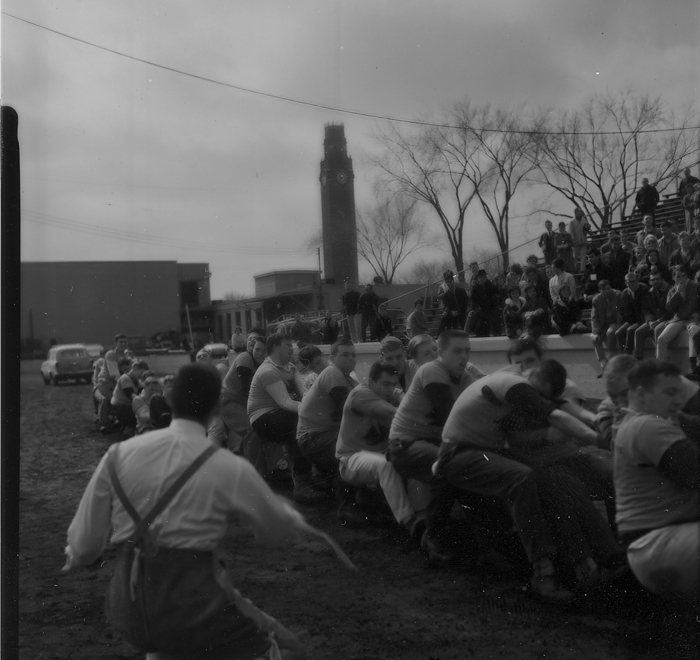 Don’t know why that name was chosen, but the football teams back in the early days of the university were called the Tigers and even the team cheers used the term. It was not until 1924 that the athletic board officially changed the team nick name to “Titans”. It was felt that the old nickname “Tigers” was not exclusive enough and only created confusion with the baseball fans that followed the city’s baseball team. In considering the new moniker, the board voted it as appropriate and distinctive since no other large institution in the country used that title. 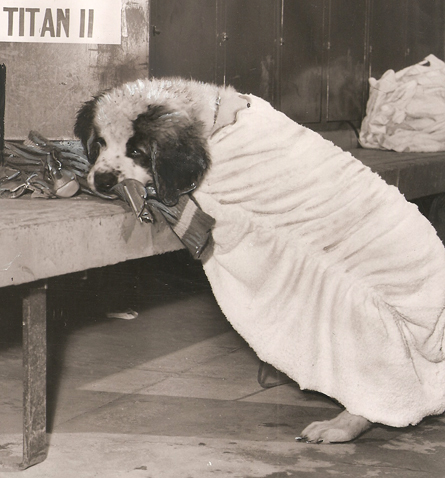 For the football games, a St. Bernard puppy called Titan was the team mascot. Not exactly going to instill any fear in the opponents, but maybe he would distract the opposing team so the Titans could win. 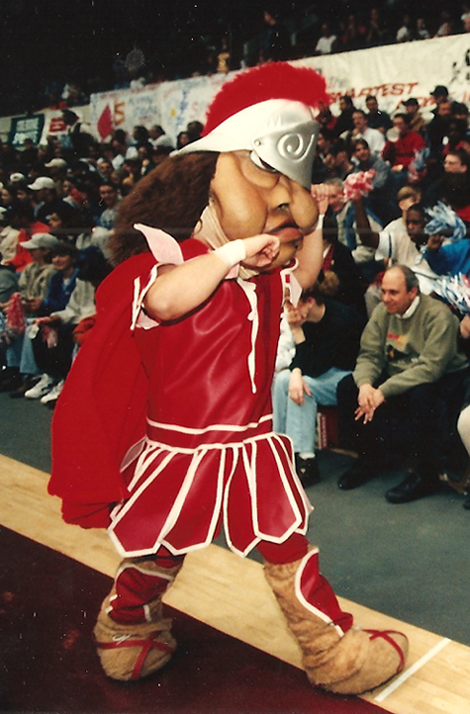 Eventually the warrior image of the Titans came into being although it went through a number of revisions before the current version. 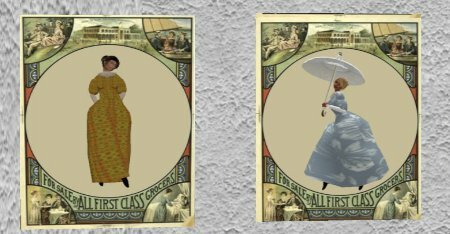 The University of Detroit Mercy has a site on Second Life to display some of the items available in the Archives and Special Collections. One of the collections is the Black Abolitionists Archive. 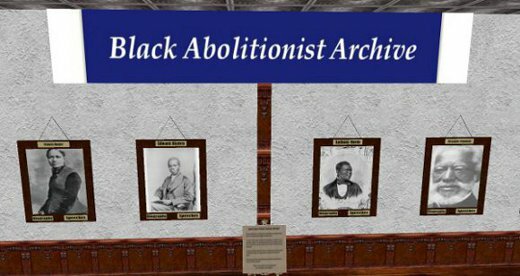 On our Second Life site, you can view portraits of some of the prominent figures of the Black Abolitionists movement and read their biographies and speeches. 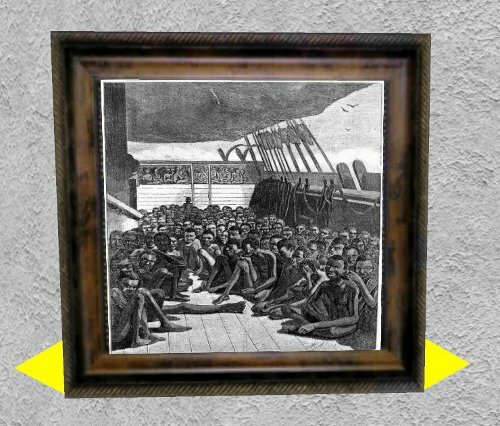 There is also a slide show of some pictures depicting scenes about the way of life for the slaves during that period. 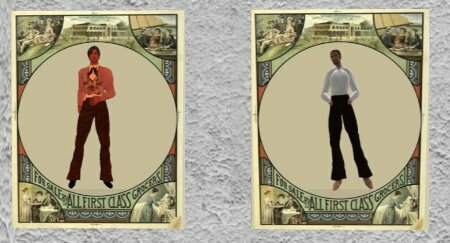 If your avatar really wants to get into the mood of the period, free clothing is available. Just click on the picture and put it on your avatar-of course it will help if your avatar is a human form, in Second Life, anything is possible! 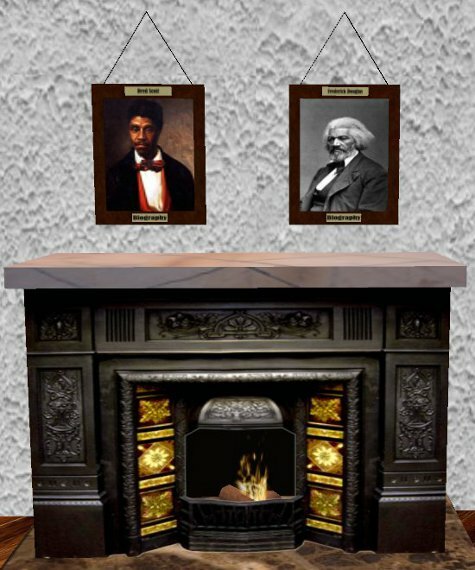 The Black Abolitionist Archive site also has an educational activity for teachers. It is hoped that some live lectures on the subject might also be presented on the site. 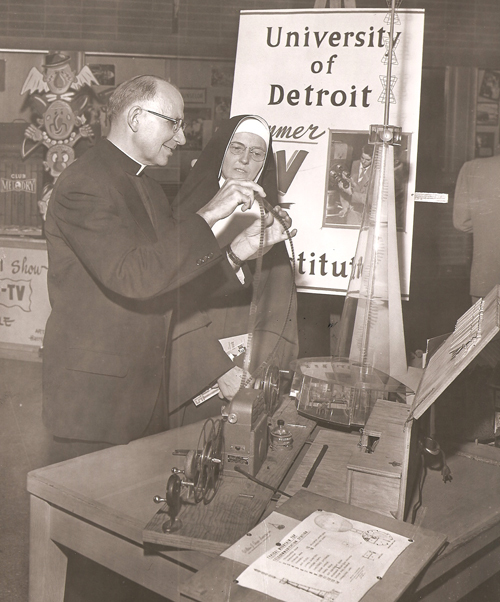 Back in the mid 1950′s, the University of Detroit was one of the first in the country to offer college level courses through the use of home television sets. The new television station WTVS, Channel 56, was formally dedicated November 21, 1955, by Mayor Albert E. Cobo. Remember-this was a time before there was any kind of device that you could record a TV program that could be played at a later time. You had to watch it early in the morning or later in the evening. If it was not available through the regular television stations, you might have to go through a special system that used a UHF (Ultra High Frequency) antenna. Not all TV sets had those at the time and a special antenna or converter needed to be purchased to view the program. 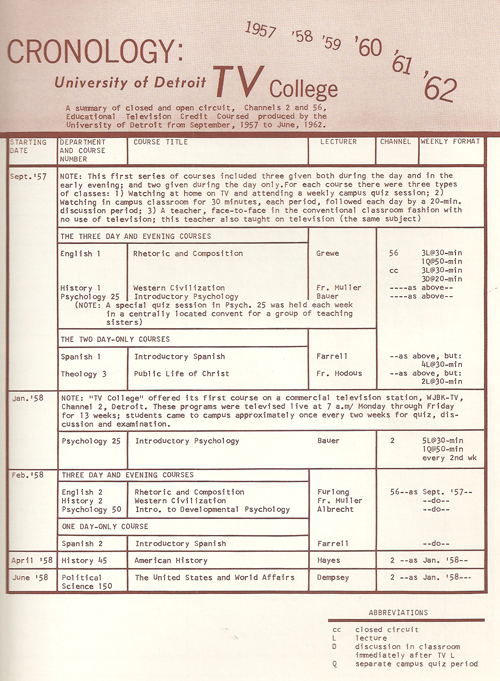 Beginning in September 1957, five regular college courses (English, History, Psychology, Spanish 1 and Theology) were offered for credit. If students were taking the courses for credit (at an amazing tuition rate of $14.00 per hour! ), they still need to come to campus once or twice a week depending on the course, to take exams or participate in discussion sessions. In the original plan Wayne State University of and the Board of Education owned and operated Channel 56. 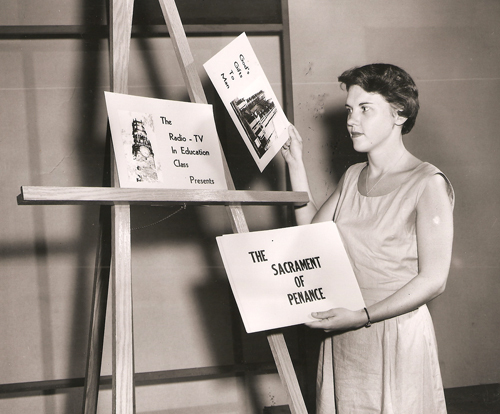 Cardinal Mooney and other non-public organizations objected to this arrangement and appealed to the FCC. The plan was changed to include the University of Detroit, the Parochial School System, the Public Library, the Historical Museum, and Marygrove College. Cranbrook and other similar institutions were also given a share in the venture. 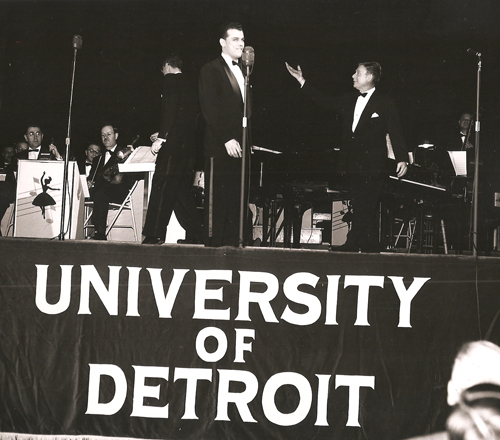 Three studios were set up-one at Wayne State University, one at the Board of Education and a third at the University of Detroit. 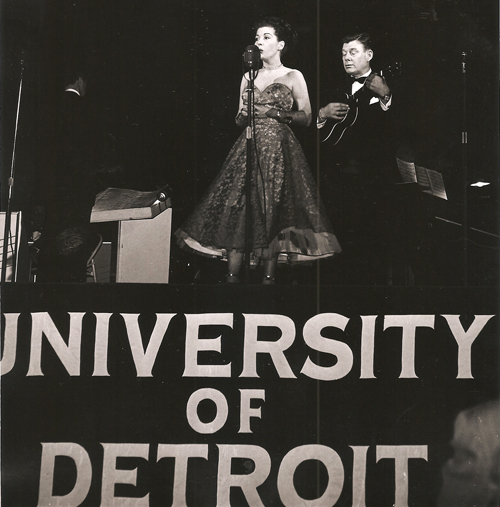 The first studio at the University of Detroit was housed in the library, but the space was limited. A nearby building formerly the Menorah Chapel became available and could be had for $225,000. The Elmer J. Smith and Annie H. Smith Foundation purchased the property and presented the deed to Father Steiner. 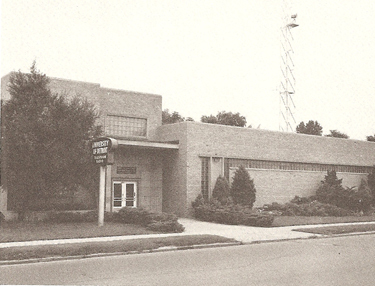 It was named the Smith Radio-TV Center and was dedicated on December 9, 1956. The building is no longer used by the the University and was sold in 2002. 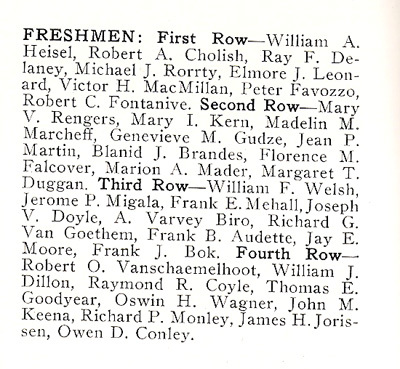 The enrollment for courses viewed though Channel 56 during 1957-58 had 236 students, with psychology as the most popular program with 94 students. The following years, enrollment through Channel 56 saw a gradual decline. The programs were also available through closed circuit which got much more use and had as many as 1654 students by 1961-62. Low enrollment and lack of financial support ended at-home credit coursed by 1965. The expected baby boom enrollment for college students never materialized. Perhaps the university was just a little ahead of its time. The University of Detroit Mercy now offers a number of courses that can be taken on-line. Unfortunately, none of the tapes from the television courses have survived (or at least I do not have them anywhere in the archives). 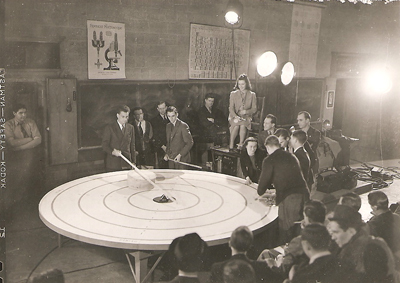 It would have been interesting to see how the courses were taught back in the fifties. 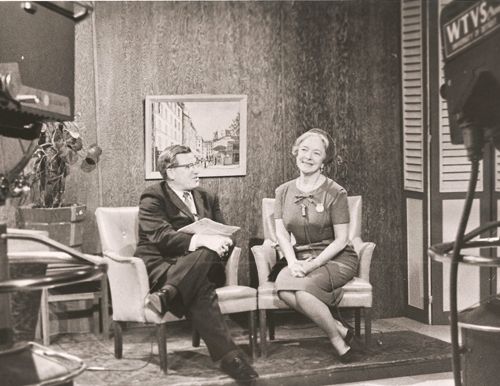 This photo of an interview with Helen Hayes, a very popular actress of film and theatre, would have been nice to see.